A perfectly clean house has never been a priority for me, so I was not surprised when I went to move my bedroom dresser to retrieve a dropped necklace and found it face up, in a snow pile of dust bunnies. Some bunnies were so large that one could imagine spending time in a craft project, gluing eyes on them to look like real bunnies. Creepy for sure, but they were that large. This would be embarrassing for many who pride themselves on their house cleaning skills and while I would never want a dirty house, a little dust here and there has not bothered me, especially when our kids were home. I would rather go walk in the woods with them and pick up fall leaves for an art project or play with the hose or in the sand box than clean house. That was true when they were older too. I would spend time with them outdoors or we would take them biking or playing sports. Even now that we are empty nesters, I would rather go on the boat or hiking or biking than clean house. I have no remorse about those choices. While cleaning the mound of dust bunnies uncovered by my jewelry mishap, I found all kinds of other interesting things lost in the abyss of the dresser caverns. Other jewelry pieces that were never missed enough to do a full scale search and a stray button, but to my surprise, among the lost items was a photo of me standing on a Glacier in Canada. It was taken in 1995 when I was in my mid-thirties and I am holding my baby, Jenny who was less than a year old in the picture, but is now a college student and beside me stands my Ben, who was two years old and now is also a college student and my oldest, Sara who is five in the picture and is now out of college and in the working world, making a life of her own. It was striking and it transported me back in time. 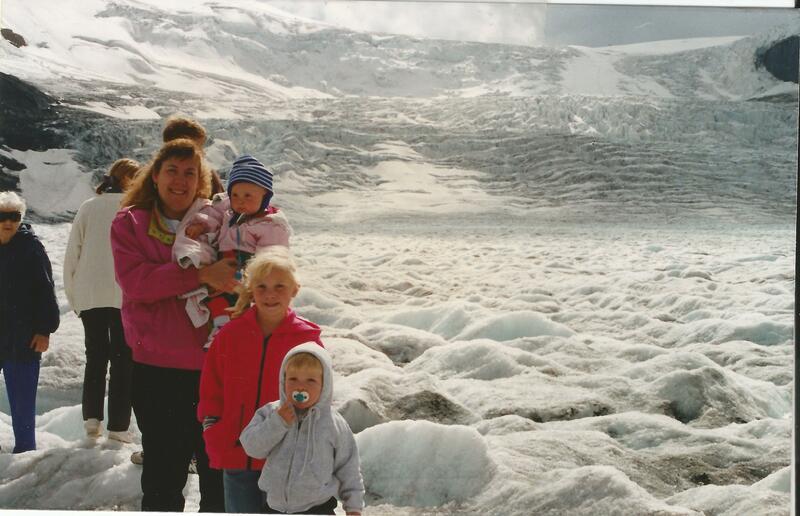 I have a smile from ear to ear and we all look happy, having just exited the large glacier snow bus onto the Athabasca Glacier in the Columbia Ice fields, during a two week driving vacation we had taken to Canada in our Ford Aerostar van. I know the word fearless is getting a little too much use these days, but it is a good word and it described what I saw in the picture. The photo was a proud reminder of our fearlessness to adventure out even with three little kids. And I have to say, I have nothing but good memories of those trips. We must have had fussy kids sometimes, but that is not what I remember and when our grown kids talk about their vacations they do not remember anything negative about them either. I remember the trip went well. We planned ahead on these adventures, but our plan was never so rigid that we could not fly by the seat of our pants sometimes, and we could adapt to unforeseen changes in weather or unplanned events. On this particular adventure we did a large loop through Canada and saw everything from the dolphin show at the Edmonton Mall to the glaciers and mountains in the Canadian Rockies. We had three little kids, but no worries. We made our way, day after day experiencing new sights and foods and we laughed and we had fun. We would go with the flow and eat when we were hungry and sleep when tired. We played in Hotel pools and ordered Pizza. The saying in our family since the kids were very young is “Put your adventure pants on and let’s go!” We have been on many adventures with our family and now as empty nesters, my husband and I have sought many new adventures. Our kids are not afraid to go on their own adventures through college or with friends and I like that fearlessness in them when it comes to travel. I look into the face of that young woman, 35ish version of me and those little kids, smiling and knowing Dad is behind the camera smiling too and I see happiness and see a family who was never afraid to put their adventure pants on. I look back and I wonder how we had the guts and the brains to make those choices. I cannot explain it because I think we are very average in many ways, but I am sure glad we did it. Life is short and I know it is said too often, but those child-rearing years flew by and those kids are now gone. I am glad I spent little time worrying about dust bunnies and cleaning, and took the time to enjoy those kids and show them the world with our adventure pants on.